Bicycle culture can refer to a mainstream culture that supports the use of bicycles or to a subculture. Although "bike culture" is often used to refer to various forms of associated fashion, it is erroneous to call fashion in and of itself a culture. Cycling culture refers to cities and countries which support a large percentage of utility cycling. Examples include Denmark, the Netherlands, Germany, Belgium (Flanders in particular), Sweden, China, Bangladesh and Japan. There are also towns in some countries where bicycle culture has been an integral part of the landscape for generations, even without much official support. That is the case of Ílhavo, in Portugal. North American cities with strong bicycle cultures include Madison, Portland, San Francisco, Boston, Toronto, Montreal, Lincoln, Peoria, and the Twin Cities. Within the cycling community, activism may take many forms, and may include creative and practical approaches. These include bike-related music, bike-related films, organized bike rides (often noncompetitive—i.e. Critical Mass and World Naked Bike Ride), art bikes displays, printed-word materials (such as blogs, zines and magazines, stickers, and spoke cards), and the publication and distribution of books (such as: Thomas Stevens's Around the World on a Bicycle, Mark Twain's essay "Taming the Bicycle" and H. G. Wells's novel The Wheels of Chance). There are hundreds of bicycle cooperatives offering spaces for cyclists to replace their own bikes and socialise. Many cities contain subcultures of bicycle enthusiasts that include racers, bicycle messengers, bicycle transportation activists, mutant bicycle fabricators, bicycle mechanics, and bicycle commuters. Some such groups are affiliated with activism or counterculture groups. These hybrid groups often organize activities such as competitive cycling, fun rides, protests, and civil disobedience, such as Critical Mass. Some groups work to promote bicycle transportation (community bicycle program); others fix bicycles to give to children or the homeless (Bikes Not Bombs). There are also feminist groups of women of color who promote the empowerment of women through their rides such as Ovarian Psycos. Bicycle magazines and organizations give awards to cities for being "bicycle friendly". Examples include Boulder, Minneapolis, Austin, Philadelphia, Madison, Seattle, and Portland—all cities that promote bicycle culture. Midnight Ridazz is a group of bicycle enthusiasts who ride every second Friday of the month in Los Angeles, California to inspire more people to ride bicycles. Rides often exceed 1,000 cyclists. Similar midnight rides such as the Midnight Mystery rides of Portland and Victoria, the bi-monthly Midnight Mass of Vancouver BC, and similar rides across the US and Europe have been growing in popularity. Cycling is the norm in countries like Denmark and the Netherlands. In Denmark, 16 percent of all trips are made by bike—and as much as 50 percent of urban populations cycle to work and school. In Amsterdam, Netherlands, 63 percent of Dutch people ride their bikes every day. Strong cycling infrastructure helps encourage cycling in these cities, and so cycling is the fastest, most convenient way to get from one place to another. Mainstream bike cultures are characterized by notions of function over form. In mainstream bike cultures, there is less of a differentiation between cyclists and the rest of the population. People of all demographics cycle regularly, and most are less concerned about cycling attire and bike performance. It is not uncommon to see people cycle in business attire or on an old rusty bike. ^ Snob, Bike (2009). Bike Snob: Systematically & Mercilessly Realigning the World of Cycling [Hardcover]. ^ "Great Plains Trails Network | Jogging, Biking, Walking, Horseback Riding Trails | Lincoln". Gptn.org. Retrieved 2016-06-02. ^ Furness, Zack (2010). One Less Car: Bicycling and the Politics of Automobility. 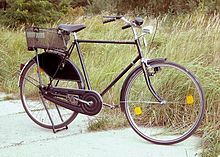 ^ "Facts about Cycling in Denmark - Cycling Embassy of Denmark". Cycling Embassy of Denmark. Retrieved 2016-04-27. ^ "Copenhageners love their bikes - The official website of Denmark". denmark.dk. Retrieved 2016-04-27. ^ "Cycling facts and figures | I amsterdam". www.iamsterdam.com. Retrieved 2016-04-27. Zack Furness, One Less Car: Bicycling and the Politics of Automobility. Temple University Press, 2010.